More of the ancient Roman city of Verulamium’s secrets have been discovered by archaeologists. The burnt remains of a 1,800-year-old kiln – a type of oven used to create pottery – have been unearthed during excavations of the ancient city near the modern city of St. Albans in Hertfordshire, Great Britain. Verulamium was the third largest City in Roman Britain and around half of it stood on the site of what is now Verulamium Park, St Albans. It is the fifth kiln to be found at the historic site with the others having been located several decades ago. Essential work started last month by Cadent to re-lay a gas pipe has involved digging deep holes. 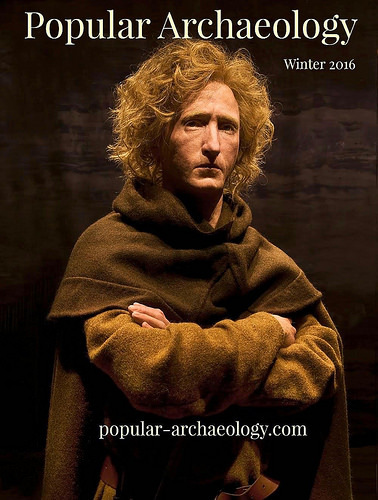 This has provided archaeologists with a rare opportunity to look underground. They have already redrawn the map of the Roman city after making a series of surprising discoveries. Where they once thought a crossroads existed, instead they found compelling evidence of a wealthy Roman’s town house, possibly featuring mosaic flooring. One corner of the city wall was also discovered although, surprisingly, there was no sign of a tower. Its absence is significant as it suggests the city walls were built as much for image as for defense. Now the fifth kiln has been found close to where four others were uncovered when the Abbey View running track was built in the late 1980s. Three of those kilns were excavated and the other was left intact as it was not under immediate threat. 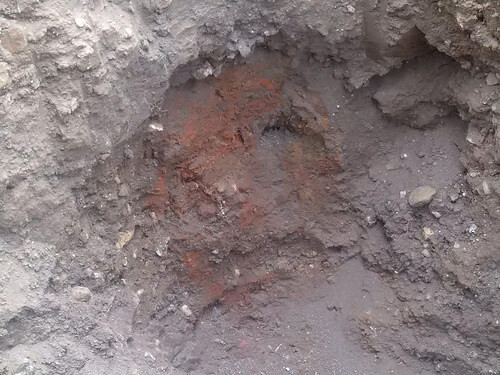 The kiln’s burnt remains have given the soil a deep red-orange colour while some shards of broken pottery, known as wasters, were also detected. Simon West, District Archaeologist for St Albans City and District Council’s Museums team, said: “The pottery kiln is another exciting discovery that gives us a greater understanding of how Verulamium was set up. The old gas main would appear to cut through the middle of it. “It is further evidence of just how advanced and productive the Romans who settled in Verulamium all those centuries ago were. The archaeological recording work is being managed by Amec Foster Wheeler, on behalf of Cadent, and the excavation team is from AOC Archaeology Group. It is being monitored by the St. Albans Museums team and Historic England to ensure it complies with local policy and national legislation to protect the historic environment. Remains of Verulamium’s walls, defensive ditch and a Roman villa’s hypocaust, a sort of central heating system, can be seen in the park. Verulamium Museum on the park’s edge contains a range of exhibits and was established following excavations carried out by Sir Mortimer Wheeler in the 1930s. Items on display include coffins with skeletons, mosaic floors, coins, pottery, jewellery and cooking utensils. Earlier major excavations were conducted by Sheppard Frere in the 1950s and early 1960s with later investigations taking place under the current museum entrance. Cadent has replaced 1.5km of aging gas mains with tough new pipes to safeguard gas supplies for decades to come. 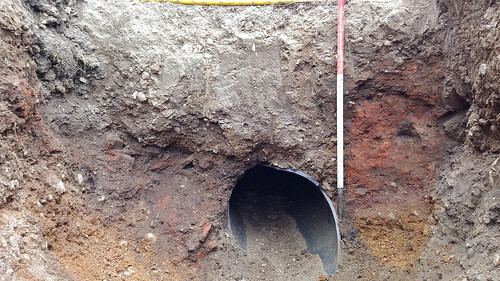 Photo: Remains of the Roman pottery kiln unearthed in Verulamium Park. The bowl shape of the base of the kiln can be seen in the discoloured soil. An area of intense heat on the right side has left a deep red-orange colour while on the left there are fragments of broken pottery, known as wasters, in what may be the remains of the kiln’s vault. The gas pipe has cut through the middle of the kiln.